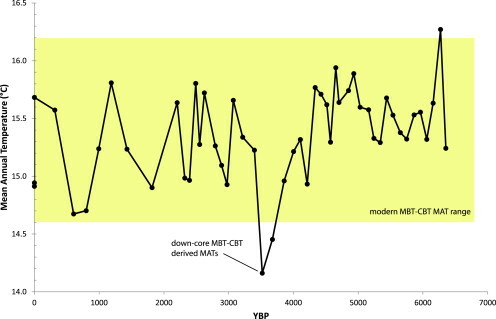 A new paper published in Quaternary Science Reviews reconstructs the mean annual temperature in the Pearl River Basin, China over the past ~6,300 years and finds another non-hockey-stick with the modern mean annual temperature of ~15.4C exceeded many times in the past including during the Medieval, Roman, Minoan, and Egyptian Warming Periods, and by the Holocene Climate Optimum. Horizontal axis is years before the present. Modern mean annual temperature is ~15.4 C.
The Dongge speleothem δ18O record mirrors the Pearl River Estuary BIT record. This suggests both are driven by regional precipitation (Asian Summer Monsoon). Leaf wax δ13C values reflect the initiation of anthropogenic cultivation ∼2 ka. Scale-equivalent comparison with climate model-data is possible for the first time. The Dongge Cave speleothem δ18O record, which lies in the Pearl River basin (China), has been interpreted as recording a regional decline in Asian Summer Monsoon precipitation over the last 6.5 ka. The same overall trend is seen in the bulk sedimentary organic δ13Corg record from a core in the Pearl River Estuary. However, the two records differ in detail and the regional nature of the Dongge palaeoprecipitation signal has therefore been questioned. Our study re-evaluates both records by constructing, for the same estuarine core, biomarker and compound-specific δ13C records, which have better constrained terrestrial and marine end members than δ13Corg, providing additional insights into the evolution of the Asian Summer Monsoon. The Branched Isoprenoidal Tetraether (BIT) index reflects the ratio of soil versus marine organic matter. The BIT record from the estuarine core co-varies with the Dongge Cave δ18O record suggesting the two share a common control which is likely to be driven by regional climate. By contrast, the sterols, n-alcohols and n-fatty acid ratios show the same overall trend as Dongge, but parallel the δ13Corg record's variability between 6.5 and 2 ka indicating a partial decoupling between soil and land-plant organic matter fluxes in the Pearl River Basin. There is clear divergence between the biomarker and 13Corg records from 2 ka to present. Analysis of the leaf wax δ13C suggests that this results from an abrupt change in vegetation probably resulting from local, anthropogenic cultivation two thousand years ago. The basin scale of these estuarine records equates to up to 15 grid cells in typical Earth System Models used for simulating global climate. This permits comparison of Palaeoclimate Model Intercomparison Project simulations of the mid-Holocene with spatially equivalent data relating to the Summer Asian Monsoon, for the first time.